History: (What If? 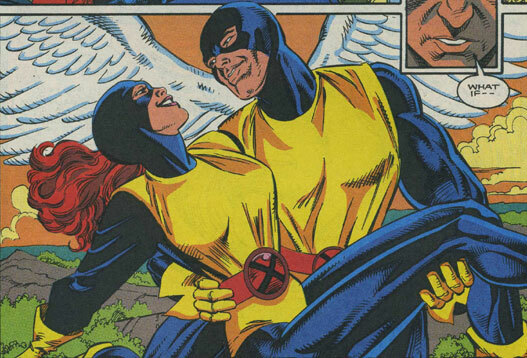 II#60/2) - When Jean Grey first joined the X-Men, her attention was caught by Warren Worthington III, the Angel. While they shared much of their time together, Scott Summers became more withdrawn, throwing himself into his X-Men missions. He became more determined and relentless in battle, eventually tracing the Brotherhood of Evil Mutants to their Asteroid Base while Professor X remained on Earth, apparently comatose following a mission where he took to the brunt of a trap set for the X-Men. Back on Earth, Cyclops was angered to find that Professor X was not comatose at all and that it was a test to see how the X-Men worked together without him. Cyclops soon became the loner of the X-Men and when Xavier announced that he was going to be away for a time, he appointed the Beast leader instead of Cyclops due to Scott's rigid and driven behavior. Angry, Cyclops quit the X-Men and wandered his way to New York City where he was confronted by Quicksilver and Scarlet Witch. After talking with them, Magneto appeared and invited Cyclops to join him. Cyclops agreed and then walked away with the trio, joining the Brotherhood of Evil Mutants. The divergent point for this reality occurred during the events seen in X-Men I#1 (September, 1963). The Brotherhood of Evil Mutants were the same as their Earth-616 counterparts up until Cyclops quit the X-Men. After discovering that Cyclops had quit, Magneto sent Quicksilver and Scarlet Witch to speak with Cyclops. Magneto himself then appeared and offered a place for Cyclops in the Brotherhood. Angry at the X-Men, Cyclops reluctantly accepted. They were (from left to right): Mastermind, Magneto, Quicksilver, Toad, and Scarlet Witch. 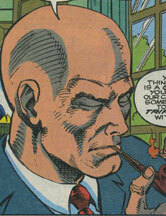 Professor X was the same as his Earth-616 counterpart up until he faked being comatose to test the X-Men. When he revealed his ruse, Cyclops was angry that Xavier had played with their emotions. Noticing that Cyclops had become more rigid and driven, Xavier opted to place the Beast in charge of the X-Men when he left for a time. Professor X had the same telepathic powers that his 616 counterpart had. The X-Men were basically the same as their Earth-616 counterparts, except that the Angel was dating Marvel Girl instead of Cyclops dating her. During many of their missions, Angel flirted with Marvel Girl and he saved Cyclops' life when Magneto's Asteroid base was breaking up. 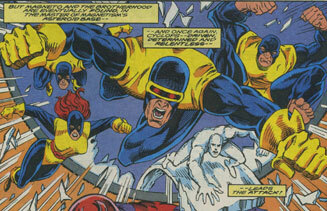 Eventually, Cyclops became more withdrawn and angered at not being made team leader, he quit the team. They were (from left to right): Marvel Girl, Angel, Cyclops, Iceman, and the Beast.